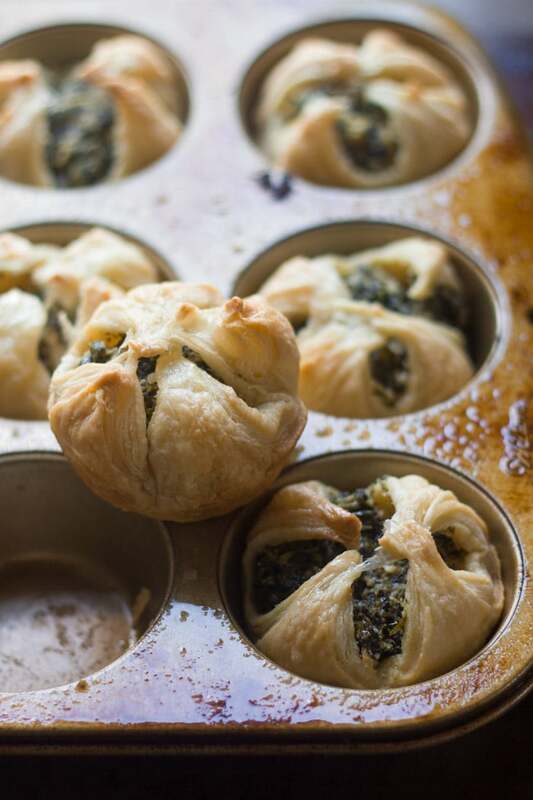 Puff pastry shells are stuffed with a mix of spinach, creamy cashew cheese, garlic and dill, and then baked to flaky perfection to make these mouth-watering vegan spinach puffs. I just checked and I have 792 published posts on this blog. Damn! And most of them are recipes. I can’t even get my head around that. Like, when I try to think of what recipes I have on the blog, for example when someone asks for a recommendation, I can usually think of five dishes, max. So sometimes I’ll come up with a new idea that I think is totally groundbreaking, go and make it and then realize it looks a lot like something I made two years ago. Or a week ago. That’s kind of what happened with these puffs. It wasn’t until I popped them out of the oven that it occurred to me that they look a lot like this quiche from two years ago. Check it out. Spinach. Puff pastry. Dill. But: that’s a quiche and these are cheesy little appetizer puffs. Am I making too big a deal of this? My husband seemed to think so. He talked me down and convinced me that they’re sufficiently distinct and I need to blog this. Then he taste tested a puff and promptly insisted that I blog these. They’re seriously tasty. 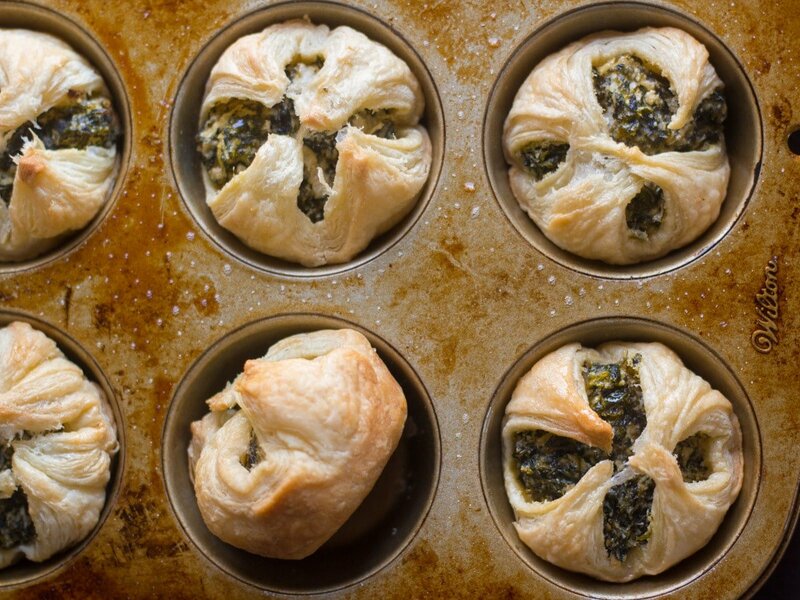 I adapted my spinach puffs from this non-vegan recipe. It was pretty easy. Cashew cheese was a perfect stand-in for the feta. 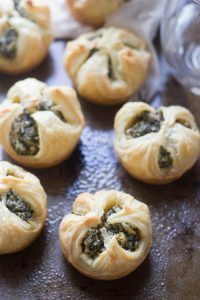 The original recipe suggests eating these as a main dish, but I always think of spinach puffs as an appetizer. Isn’t anything with “puffs” in the name generally a snack or breakfast food? Anyhow, they definitely seem more appetizer-y to me, and pretty perfect for holiday entertaining. Best of all — they’re pretty easy to throw together. Save time by using store-bought puff pastry (lots of brands just happen to be vegan!). You can even prep the filling ahead and refrigerate or freeze it for later. I actually froze a big stash myself because I’m sure I’ll want to whip these up again for some holiday celebrations later this month. 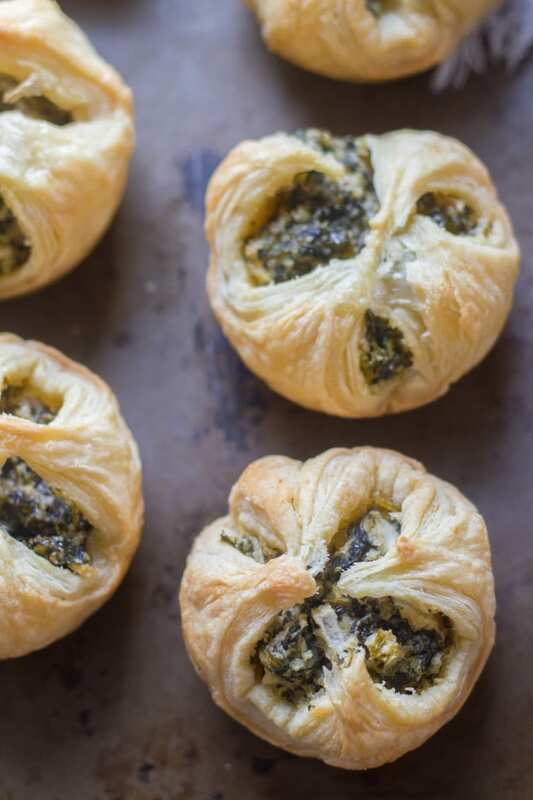 Puff pastry shells are stuffed with spinach, creamy cashew cheese, garlic and dill, and then baked to flaky perfection to make these vegan spinach puffs. Place the cashews, milk, lemon juice, garlic, and salt into a food processor and blend until smooth, stopping to scrape down the sides of the bowl as needed. Drain the spinach and squeeze it to remove as much moisture as possible. Add the spinach to the food processor bowl, along with the onion and dill. Pulse until the ingredients are fully mixed. Cut each sheet of puff pastry into 3 strips of equal length, and then cut each strip into thirds, making 18 squares. Place each square into the bottom of a muffin cavity, stretching it out just a bit by hand if needed so the corners reach a bit beyond the top of the cavity. Spoon about 2 tablespoons of the spinach mixture into each puff pastry square. Fold the corners of each square inward and pinch then together at the center. Brush the top of each puff with a bit of olive oil. Bake until the puffs are lightly browned and puffy, about 25 minutes. Remove the tins from the oven and allow them to cool a bit before removing the puffs. Loosen the puffs from the tin by placing a knife down the side, between the puff and the tin. Oh wow!!! So looking forward to making these…thank you…and thank your hubby for convincing you to blog this :-) Merry Christmas! Thanks Cathy!! I hope you enjoy them as much as we did! Merry Christmas to you too!! If you don’t remember, neither do we! When in doubt – post. You are absolutely right. These are perfectly fun for holiday. I also love your idea of using muffin pan to bake them! This is PERFECT timing since I have a Christmas party on Saturday and will need some yummy snacks to bring that I can enjoy!! YAY! These look SOOOOOOo good! Oh perfect!! I hope they’re a hit! These were great ! Very tasty thank you ! I LOVE YOUR BLOGS😃👌🏼💕 It’s the best! On this recipe, when u say puff pastry, do you mean filo dough? I don’t think puff pastry is leavened. I stand corrected! It sounds like air trapped between the layers is enough to make it puff up. Thanks Joe! Have you made these ahead and frozen the? I haven’t, but I have frozen the filling and it works! I think you could also assemble the puffs and freeze them before baking. If you bake them and then freeze I’d be afraid the pastry would get soggy. Love love love your recipes! Have you tried adding nutritional yeast to the spinach mixture for added umph and nutrition? Would it ruin the flavour combos? Thank you! I haven’t tried that, but if you do I’d only use a tiny bit. These turned out pretty flavorful, so you could easily overdo it! Yay!! I’m glad you like it! I really wanted to try these, they looked sooo good. I went to get the puff pastry, but was disappointed to find Pepperigde Farm brand contained high fructose corn syrup. I returned it to thefreezer and returned home disappointed. I was wondering which brand you used. I’m glad to hear you’re enjoying them! Thanks Tamar! I just want to say thank you for this amazingly delicious and simple recipe! I love sharing foods like this with the non-veg family members. I brought this along to multiple holiday get-togethers, and people loved them! I could eat them by the dozen and have raved about them on Instagram, as well (vegan_golden_ra). They were the perfect Christmassy appetizer to bring along with my vegan lasagna, etc. I am so excited to try more of your recipes. Thank you so much Rachel!! I’m glad they were a hit! Hey, I want to make these but have a cashew allergic partner who needs to be able to eat them with me. Lol. Any ideas on substitute nutz to use? Peanuts would be too peanutty. I think macadamias would work! I haven’t tried them in this recipe, but they’ve come through for me as a cashew sub in some other recipes. :) I’ve heard that raw sunflower seeds work too, but haven’t worked much with them. I’d love to hear how it works out if you try either variation! I’ve been using sunflower seeds to replace cashew; works amazingly well and much cheaper. Soak for half an hour in hot water and use as recipe requires. If I take these to a potluck, would they still be good at room temperature? I will do this recipe for Easter…..thanks for the idea….. Thanks for this recipe! These tarts were the hit of my daughter’s vegan bridal shower. I’m so happy to hear that! Thanks Sybille! Mainly because the volume of frozen is much less than fresh, so it’s more manageable in the food processor. If you use fresh you might want to steam it a bit first, just to get it wilted. I think that should add just enough moisture too. The weight (10 ounces) should be about the same. I’d love to hear how it turns out if you try it! Is the serving size per prepared muffin tin? Or is there a different recommended serving? Thanks! I made them ! Very tasty and yummy! Easy to make and freeze. Thanks for sharing the recipe !! Yay!! I’m so glad you enjoyed them! Thanks Shoba! Holy smokes! Yummo !!! These are so good . Cant stop eating them . Thanks Amanda!! I’m so glad you’re enjoying them!! I made these puffs and they were absolutely delicious! 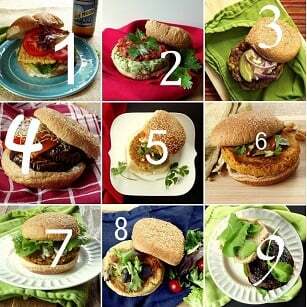 This is such an easy, fun recipe–thank you so much! Yay!! Glad you think so! Thanks Diana! I made them in my ninja! They were surprisingly easy to make. I used mostly cashews but added sunflower seeds. I’m super happy with the results. Gracias! I’ve made these a bunch of times, once added some artichoke hearts, another time some vegan cheddar near it’s expiration. Turn out great every time. Thanks so much! These look delicious! Can they be assembled a coup,e hours ahead of time before baking? I’m thinking it’s easier to have them assembled before everyone arrives and then pop them in the oven when ready. Yup! Last year I actually assembled them a day ahead and kept them in the fridge, then took them to my mom’s house for brunch and baked them there. :) I hope you enjoy them! This looks wonderful, but I am allergic to onions. Can you think of an alternative veg (not peppers or mushrooms, as I have a similar problem)? I love your blog, but these pesky allergies! Thank you! How about celery? Can you have other alliums? If so, I’d try something like shallots or scallions. Otherwise, finely chopped celery or carrots might work! The flavor will be different, but I think it would work! I can do garlic, but the others are problematic. I might grow garlic and celery, and maybe a little cumin to get a good flavor profile. I think that sounds like a good plan! Cumin should be a nice addition! so I plan on making these this weekend, but want to verify a standard muffin tin is 2 1/2″ across by 1 1/2″ deep? These look small and I was actually thinking a mini tin would make more sense? Hi – These sound deLish! I’d like to make them mini size …any advice? Should I roll the pastry out a little? Thanks! I’d definitely roll the pastry out! It puffs up quite a bit when you cook it, so otherwise it might become too much for the little muffin tins. My only other suggestion is to watch them closely, as the cook time could be a bit shorter. Enjoy! !